^ David Schwimmer's serious side. NBC News. November 21, 2003 [May 21, 2018]. David Schwimmer: "And when it comes to certain prejudice and the hatred that still pervades this country I'm a Jew first and not a white person." ^ Saraiya, Sonia. David Schwimmer puts in the work: On learning wine, waiting tables and why he “campaigned for years for a black girlfriend” for Ross Geller. Salon. May 27, 2016 [May 21, 2018]. David Schwimmer: "Yes, I was Jewish"
^ Solny, Shiryn. Mayor Rahm Emanuel, Actor David Schwimmer Bond Over Having Critical Jewish Mothers. Algemeiner. February 15, 2018 [May 21, 2018]. ^ Bloom, Nate. Interfaith Celebrities: The Talk’s Hosts and David Schwimmers Bride. InterfaithFamily.com. October 26, 2010 [May 21, 2018]. ^ Hello Magazine Profile - David Schwimmer. Hello!. hellomagazine.com. [2009-03-29] （英语）. ^ 6.0 6.1 David Schwimmer Biography. Yahoo!. [2009-03-29] （英语）. ^ Hill, Aubrey. Band of Brothers impresses. BBC News (BBC). September 14, 2001 [2009-03-29]. Part of the problem... may have been the ridiculous fact that Friends favourite David Schwimmer plays the hard and cruel Captain Herbert Sobel. The only thing believable about Schwimmer's acting is when he cowers in the face of true battle. His puppy dog eyes make him appear even more pitiful. 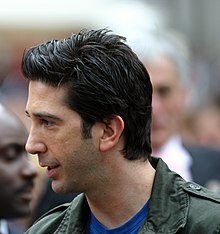 ^ Awards for David Schwimmer. IMDB. [2009-03-29] （英语）.